Where do I use my A2Z Airport Parking voucher code? “A2Z Airport Parking offer discounted prices to their valued and loyal customers." Travelling to and from airports can be very difficult, especially if you are travelling with children, large luggage or a disabled person. When you are travelling from an airport the very first thing that can make you stressed is airport parking. But with A2Z there is no need to worry, they are here to help you with your airport parking and are also committed to saving you money. A2Z compare prices for all the major UK airports in a matter of seconds and then present you with the lowest prices and best deals that offer up to 70% off. With the A2Z Airport Parking price match promise you will never find a better price, and if you do, A2Z will match it to ensure you always pay the lowest with them. Search for your ideal airport parking using the search bar on the A2Z website. You can find airport parking at Birmingham Airport, Gatwick Airport, Heathrow Airport, Luton Airport, Manchester Airport and Stansted Airport. 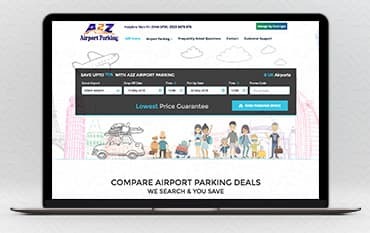 A2Z Airport Parking offer discounted prices for valued and loyal customers, so to save on top of their already impressive 70% off then sign up to the newsletter for all the latest discounts. A2Z Airport Parking finds the cheapest meet and greets as well as park and ride deals that suit every customer’s needs. By searching and pre-booking airport parking via A2Z Airport Parking you can save up to 70% compared to paying on the day at the gate. All you have to do is select your desired airport and drop off and pick up date and time, then press ‘find parking space’ and you’ll be displayed with a list of low-cost airport parking results. If a convenient and stress-free parking experience is what you’re looking for at Birmingham Airport then A2Z Airport Parking is the perfect place to book your car’s stay. A2Z offers the solution of all your airport parking problems at Birmingham Airport in the form of impeccable and cost-efficient airport parking deals as well as great customer service and an easy booking system. A2Z offers to meet and greet, park and fly and valet airport parking deals at Birmingham Airport with day stays starting at just £6.14. All you have to do is choose an airport parking option that suits your parking needs and budget. Get rid of stressful onsite parking and reserve a parking space in advance with A2Z, enjoying 70% off in the process too. Heathrow Airport is one of the major international airports and the sixth busiest airport in the world. Using a prepaid airport parking service such an A2Z is the best option for you when travelling to and from Heathrow Airport as this way you can avoid the hassle and stress of expensive cabs and crowded public transport services. A2Z Airport Parking offers the best, competitive and affordable Heathrow Airport Parking deals without compromising on the level and quality of parking their service. Providing the most economical rates, A2Z offer parking at Heathrow from just £6.14 a day and £43 a week. With such a vast variety of airport parking options at Heathrow airport, you can easily find the one that suits your needs. Find and book Heathrow meet and greet parking, Heathrow park and ride parking, Heathrow valet parking services, Heathrow short parking and Heathrow long stay parking, all with up to 70% off. Allow enough time to arrive prior to the car park and also make sure you are on your booked time to avoid any delays in dropping off your car. All cancellations must be made directly through A2Z Airport Parking LTD in order to be valid. Please click here to send your cancellation request within office hours only (Monday - Friday 09.00 to 17.00 excluding bank holidays). If you send a cancellation notice less than 48 hours from the date of departure, you will receive no refund. If you send a cancellation notice more than 48 hours cancellation from the date of departure you will have to pay a 15.00 GBP admin charge. A2Z Airport Parking provides airport parking in locations all over the UK including Birmingham Airport, Gatwick Airport, Stansted Airport and Manchester Airport. A2Z compares prices for all the best airports in the UK in seconds, doing all the work for you so you can easily be presented with the lowest price and then book. With A2Z’s price promise you can rest assured that they’ll never be beaten on price, providing up to 70% off airport parking, and if you pair their already reduced prices with one of our discount codes you can save even more on your parking too. We are constantly on the hunt for Promo Codes for A2Z Airport Parking to help you with your money saving. Our experts check dozens of sites for secret codes including NHS discounts, student sites & social media channels saving you time & money!